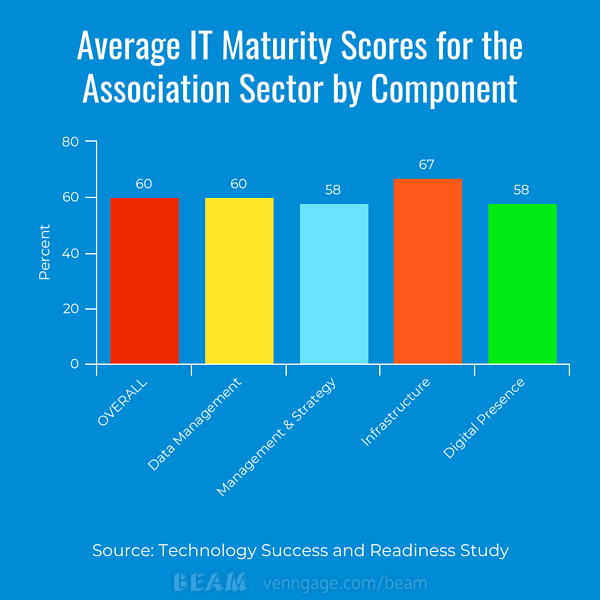 When it was published in late 2016, Tech Success for Associations, an ASAE Foundation report based on DelCor’s IT Maturity Model, revealed—for the first time—the state of technology maturity among associations. The report “sheds light not only on the current state of association technology, but offers a vision of what associations can do to prepare for the future.” Let’s look at some of these findings and what they mean for your association’s technology management moving forward. DelCor’s IT Maturity Model includes four key components of association technology: infrastructure, data management, IT management and strategy, and digital presence. 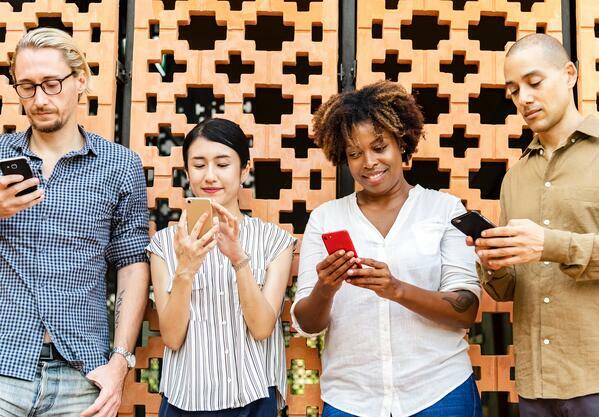 ASAE Foundation’s landmark study mirrors these four areas and answers the question: how are associations performing in each one? Associations are largely successful in ensuring that staff can access the necessary technology to perform their jobs remotely, managing server role configuration, and replacing infrastructure on a scheduled basis in accordance with effective practices. However, associations should take a more forward-looking approach to infrastructure, or find a technology partner who can help them see the future, because half of associations are merely responding to technology needs, rather than planning ahead for them—for example, they’re ignoring the cloud. The report indicates that associations scoring higher in infrastructure also have higher staff satisfaction. These organizations rely almost entirely on cloud computing, “which frees IT staff and/or decision makers to focus on other technology issues and initiatives.” With benefits like these, it’s time to stop ignoring the cloud. Big data. Data privacy. Data backup and recovery. In associations, data management plays an outsized role. In the most successful organizations, data support business intelligence, help association decision makers understand the needs and preferences of members, and guide sound decision-making. Mature organizations collect, analyze, and use data to deliver value to their constituents. They have a commitment to ensuring a high level of data integrity, and they maintain their data in an integrated network. With a score of 60, associations are “marginally effective” in data management. High-scoring associations leverage their enterprise systems—AMSes and CRMs—for a complete view of individual members, whereas low-scoring associations only review data half as frequently as they should. Obtaining a complete member view is impossible for them without up-to-date, accurate data. Data privacy didn’t factor highly into scoring, as Europe’s General Data Protection Regulation (GDPR) wasn’t on most of our minds when the study was undertaken. Yet data breaches and data privacy issues are ever-present in news about corporations, governments, nonprofits, and associations alike. We recommend associations take this opportunity to review and revise data management policies. You’ll increase your IT maturity in this area and also benefit from improved day-to-day data practices. We encourage associations to emulate their “mature” counterparts by including IT at the strategic planning table. Associations that do are taking full advantage of technology to maximize the value of membership. Yet, on average, IT management and strategy scores just 58 (marginally effective) among associations. What’s dragging that number down? Inadequate training and insufficient opportunities for staff to discuss IT. If your association isn’t providing those technology resources, we have some advice for bridging your staff’s IT knowledge gaps. IT staff in high-scoring organizations marry technology projects to organizational goals. But they can only do that if they understand and stay focused on those organizational goals—which is why having IT at the strategic table is so impactful. According to the ASAE Foundation report, “The area of greatest success is in the inclusion of senior IT staff in the technology-selection process.” We find this particularly delightful, since DelCor has for decades guided associations in the selection and implementation of mission-critical software. What else can you do to increase your IT maturity in this area? Break down those silos already! Considering how much time we all spend on the web, why does digital presence have the lowest maturity score among associations (58, tied with IT management and strategy)? I’ll venture it’s because the two are linked: how many times have you seen web, marketing, and communications teams struggle to make sense of management’s competing desires? As a member yourself, how often have you struggled to navigate websites disheveled by departmental hierarchies? Digitally mature organizations frequently take a mobile-first approach to the online experience. Websites are powerful, digestible, and intuitive enough to provide self-service. Online experiences are dynamic across platforms—website, mobile, and social. Unfortunately, many associations flounder with SEO—your lure for attracting media and new members to your content. Don’t let LinkedIn and for-profits steal all those eyeballs. Perhaps more than any area of technology, digital is morphing at a breakneck pace. Just think—Snapchat didn’t exist a decade ago, Vine came and went in 4 years, and who knows what will unfold with the next major smartphone release. Embrace a radical view of your website to add a layer of maturity to your digital presence, whatever form it takes today or years into the future. To position your association for the future, you need to know how your infrastructure, data management, IT management and strategy, and digital presence rank on the IT maturity scale. It’s data you can act on immediately to advance your association’s mission, goals, and business objectives. Your IT maturity score informs your technology roadmap, showing you where to focus your resources. Because being “marginally effective” is no longer good enough—members expect more. Excerpts and data points reprinted with permission. Tech Success for Associations. Copyright. 2016. ASAE Foundation. Washington, DC.